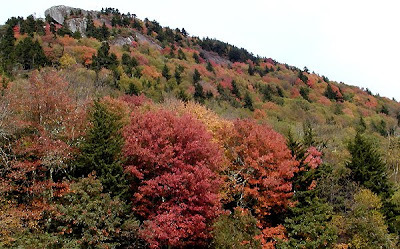 To see how the North Carolina fall foliage is progressing at higher elevations, we headed to Grandfather Mountain today. It was partly cloudy, making for a surreal scene at times when we were inside and above the clouds. We hiked a bit on the Black Rock Trail, took Csaba and Bugsy the innpugs over the mile high swinging bridge (they loved it…OK, they loved all the attention from other visitors), and were treated to some fantastic views of fall foliage. The next two weeks will be great times to visit Grandfather Mountain. We’ll share more photos of our day at Grandfather on Thursday. Mt. Pisgah — Once owned by George Vanderbilt and now part of Pisgah National Forest, Mt. Pisgah sits along the Blue Ridge Parkway just southwest of Asheville. At Blue Ridge Parkway Milepost 408.6, there is a fantastic restaurant, which is part of the Pisgah Inn. (Pisgah Inn serves lunch and dinner with spectacular views seven days a week through October.) 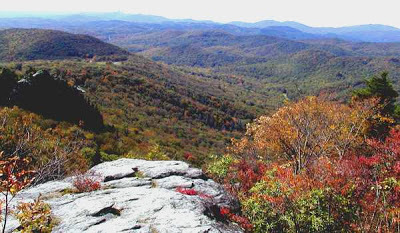 From the Pisgah Inn parking lot, you can hike north a little over a mile along the Buck Spring Trail, which then connects to the Mt. Pisgah parking lot (MP 407.6). At this parking lot (from which you can choose to start if you want to bypass the Pisgah Inn parking lot) is a 1.5-mile up-and-back trail leading to Mt. Pisgah, which is over 5,700 feet above sea level. Craggy Pinnacle — Heading north, 18 miles from Asheville on the Blue Ridge Parkway, you arrive at Blue Ridge Parkway Milepost 364.1, which is the Craggy Dome overlook. 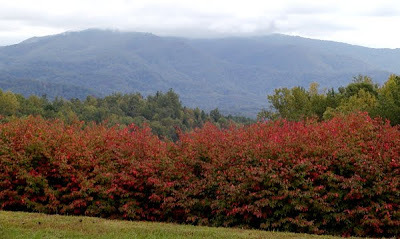 (This is past the Craggy Gardens Visitors Center). Near the upper parking lot is the trailhead for the Craggy Pinnacle Trail. The hike is an easy one, less than a mile to the overlook with its dramatic 360-degree views. This is a great stopover if you’re headed to Mt. Mitchell further up the Parkway. Linville Falls — From the Linville Falls Visitors Center, you can take one of two hiking trails to Linville Falls, which is off Blue Ridge Parkway Milepost 316.4, northeast of Asheville, Black Mountain and the Inn on Mill Creek. The Erwins View trail is a 1.6-mile roundtrip, moderate hike with four overlooks along the way. Visit www.ncwaterfalls.com/lin1.htm for a fantastic description and photos of the hike to the falls. The next three weeks will bring more splashes of fall color to our area and elevation, so stay tuned for next week’s report!